– The SMG plans to adopt the Big Data analysis method to select best location of welfare facilities for the elderly and identify best spot for conveying city governance information. – By processing more than 10 billion phone records, the number of floating population, residential population, and their estimated income will be analyzed. – The SMG looked into the areas where most elderly resides and how they frequent the facilities. The city government will reflect the findings when it expands the facility next year. – The best spot for conveying City governance information will be selected after analyzing data of residents’ information including age and where they frequent. – Another project underway is to match taxi seekers and vacant taxies based on related big data analysis. – The SMG expects that the utilization of big data will lead to more customized and practical policies. Seoul Night Bus (also called Owl Bus) started with two bus routes in April last year and due to its wide popularity; the night bus operation has been extended to nine bus routes. It was selected as the most successful customized policy of the SMG by Seoul citizens last year. Behind the success, there was usage of Big Data by the Seoul metropolitan government. The city government was able to select the most effective routes of the bus by analyzing the 3 billion phone records and reflecting the result to the selection process. Encouraged by the result, the SMG now plans to expand the use of Big Data on its vast policy making and implementing process. For example, Big Data will be used to select the best location of welfare facilities for the elderly or to choose the best arrangement of city-governance related posters. The SMG plans to use Big Data to select the area where many of the elderly resides and frequents. Consequently, the city government will be able to identify the region where supply of welfare facilities falls short to meet the demand, and reflect the result when it selects the suitable areas for the new facilities. As for city-governance information, the SMG will analyze Big Data to identity the location where most people in 20s and 30s reside and select the bests spot for the ‘Youth Employment Hub’. 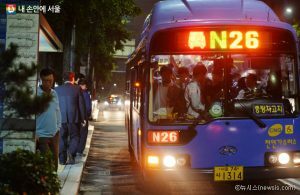 In addition, new routes of the ‘Seoul Night Bus’ will be designated around office-concentrated area where many office works work overtime. The SMG revealed these plans to utilize Big Data and to adopt more scientific approach to its policy making and implementation on April, 23 (Wed). The city government added that the plan was to offer more customized policy for Seoul citizens and to minimize wastes of its administrative resources. As first of its step, the SMG plans to adopt the Big Data analysis method in two areas, one for selecting best location of welfare facilities for the elderly and the other for selecting best spot for conveying city governance information. the number of the floating population of each time slot and day of week estimated by processing approximately 10 billion phone records, the data on residential population, information on the estimated income, information on facilities for the elderly, transportation network such as roads and pedestrian pavements, and the data on the number office workers. As for the location selection for the senior citizens’ welfare facility, the SMG analyzes the characteristics of the people 60 and older of each autonomous district, locations and the number of the existing facilities and conduct a supply-and-demand analysis and look into the usage of the existing facilities. As a result, it was revealed that 89% or about nine out of 10 senior citizens used the facilities in their districts and only 4.5 of senior citizens frequented two facilities or more. In addition, 63.6% of users were found to frequent nearby facilities, where they can reach within 16~17 minutes by walk, while 20 % of the elderly preferred large scale facilities with advanced quality even if they had to walk more or take a car to reach there. The SMG will reflect the foundings in its next year plan to expand senior welfare facilities. In the meantime, as for best spot identification for city governance information, the city government devised advanced system for its PR media and outlet, which used to be managed through excel files. The SMG accumulated related data on the system. The information on the floating population of each unit is classified by small units, which then rearranged by gender, timeslot, and ages. And residential population, facility information of each unit are stored and managed on the system. The city government plans to utilize the data on selecting best arrangement for city governance information for each age group and depending on the residential characteristics. The SMG expects that this method will encourage more citizens’ participation in the city governance and satisfies their right to know. In addition, the SMG is pressing ahead with the ‘Taxi Matchmaking Project’, which connect taxi seekers and vacant taxies based on the analysis of the data on taxi stand-by locations and where passengers usually get on and off the cabs. The SMG will work to offer more customized policy by utilizing Big Data in its decision and policy making process, which will directly benefit citizens and facilitate better communication. For instance, the SMG will analyze the car-accident prone locations and set up measures to reduce car accidents and preventive policies to improve public safety.